Now that we’ve put the new Alienware 15 (R2, Late 2015) to the test, it’s time to do the same with its bigger sibling – the 17-inch Alienware R3. Make no mistake, it’s the same Skylake / GTX 9xx / DDR4 generation, the difference being maximized screen estate. 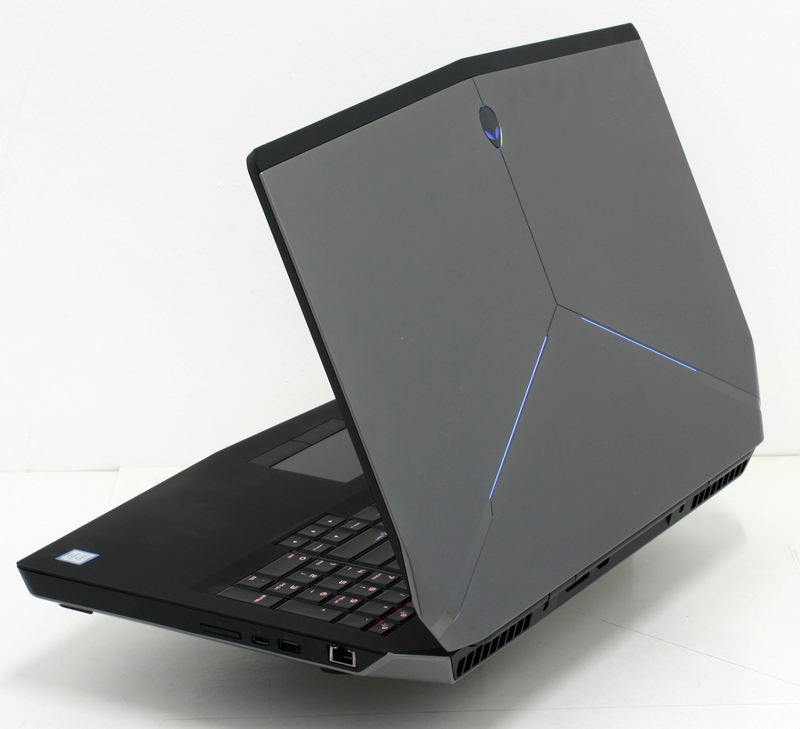 There is an 18-inch model as well, but Alienware hasn’t updated it yet with the 6th generation Intel Core processors (it offers dual GTX 980M, though). The latter also can’t take advantage of the Alienware Graphics Amplifier, which provides you with the option of enjoying desktop graphics performance when you get home with your Alienware laptop. Unfortunately, asymmetrical SLI is out of the question, but more about this later. So let’s see what we’ve got here – our unit sports Intel Core i7-6820HK, GeForce GTX 980M with 4GB GDDR5, 12GB DDR4 RAM at 2133MHz and a 17-inch UHD IPS IGZO screen. In other words – one of the fastest mobile CPUs out there, the most powerful mobile GPU, next-generation RAM technology and the best screen possible. And that’s just the beginning. This is going to be an interesting review. 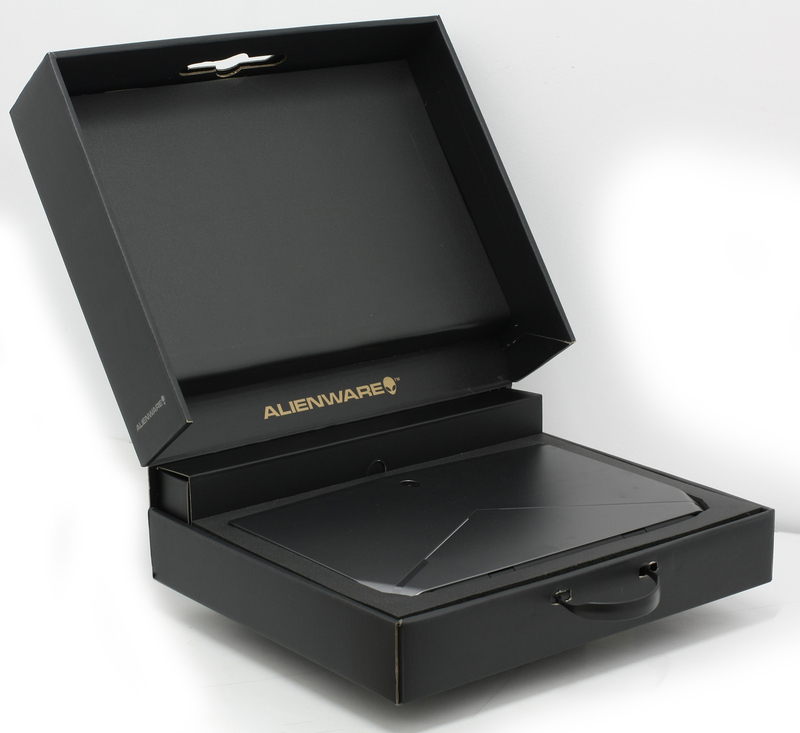 We will probably not surprise you with this one, but Alienware 17’s package looks like a parcel that’s, well, out of this world. 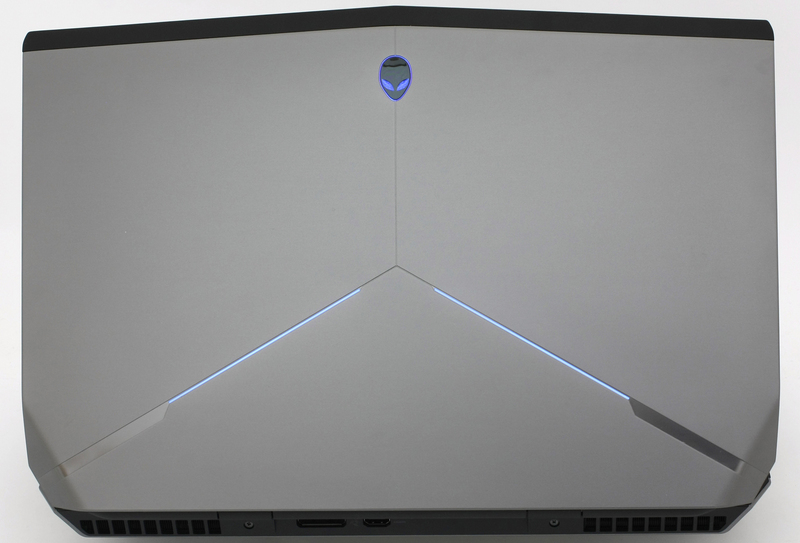 Except for a small Alienware inscription on one of the sides, it has nothing but a big Alien head – the logo of the company. While opening it, you’ll notice the attention to detail on part of Alienware that’s there to give you the best experience in the first couple of minutes with your new machine. You’ll be welcomed to the Alien community with a special “Thank You” note from the team and, of course, a Quick Start guide which you’ll instantly ignore, but nobody can judge you, given the fact that you’ve got an Alienware 17 R3 in front of you. The charger is made by Flextronics – GA240P1-00 and it’s 240W. 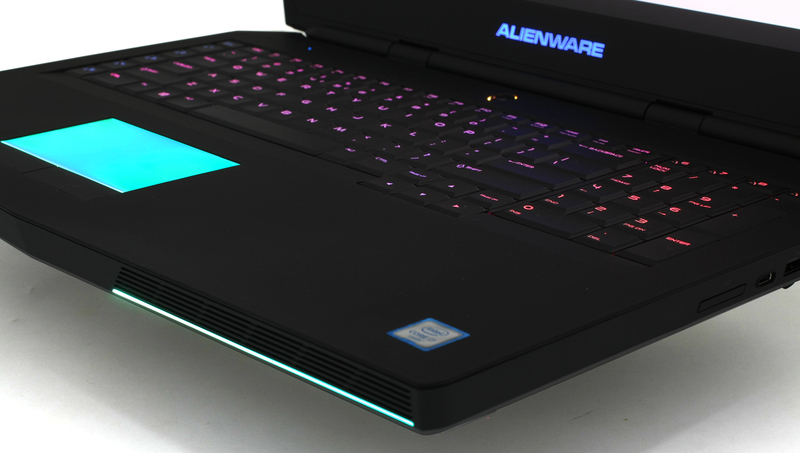 The new Alienware 17 R3 is the thinnest and lightest 17-inch Alienware ever but don’t expect much since its cooling system has to handle a 100W GeForce GPU and a Core i7 processor with TDP of 45W. R3’s is 34.4mm high and the weighs 3715g, which doesn’t sound very low but is in fact much lighter than its Haswell-based 4250g predecessor. 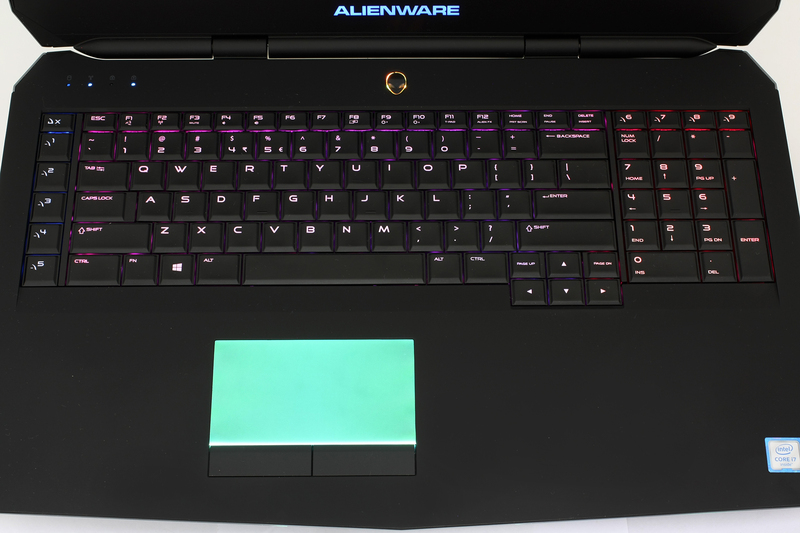 It wouldn’t be an Alienware if it didn’t have aggressive design language, sharp lines and assertive backlight on the logos, keyboard and even touchpad. The latter can be turned off if you don’t like it, because it’s definitely an attention-grabber – the trackpad’s whole surface lights up when you use it. The palm rest area is coated with matte soft rubber and the keyboard has the now familiar TactX construction used in previous generations – it’s not “Island Style”, but it’s pretty comfortable not just for gaming but for prolonged typing sessions as well. There is a NumPad panel on the right, so those of you that work with numbers frequently will take advantage of that too. Above the NumPad are four Macro keys, which can be assigned to run applications of your choice through the AlienFX software. That’s also where the backlight is controlled – you can choose from numerous combinations of lights and colors. There are another six macro keys on the left side of the keyboard, and you’ll need some time to get used to Macro X replacing ‘Esc’ at the the top left. 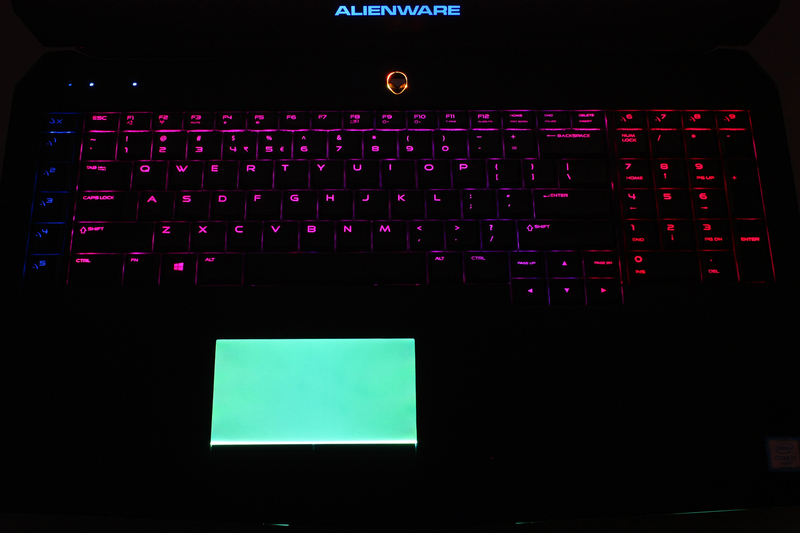 Just above the macro keys are four LED indicators, and in the center glows the Alienware logo. The hinges that hold the 17.3-inch IPS 4K panel feel pretty solid – you have to use both hands when opening the lid. Actually, the whole construction provides the sturdiness and rigidity we look for when we are reviewing high-class notebooks. That’s to be expected though, given the fact that Alienware has used an anodized aluminum shell and carbon fiber composites in 17 R3’s enclosure. Even behind the TactX keyboard, there is a reinforced steel plate protecting the internals. Alienware claims that the construction is tested to stand up to tens of thousands of power button pushes, hinges opening and closing, twists, turns, and up to 1 million touchpad strokes. We don’t know how exactly these tests are conducted, but it’s evident that Alienware has put a lot of thinking into that. On the left we have the Power-adapter port, Security-cable slot, USB 3.0 port with PowerShare, standard USB 3.0 port, Microphone/Headphone port and Headset port. The right is populated by a 3-in-1 Media-card reader, USB Type-C port (40Gbps Thunderbolt 3 / DisplayPort), another USB 3.0 port and a RJ-45 Network port. 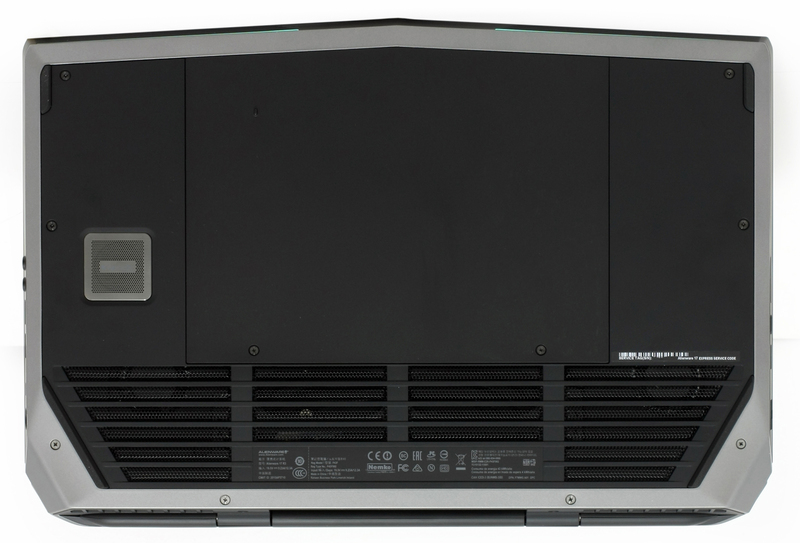 The back has an External Graphics Port (for Alienware Graphics Amplifier) and HDMI 2.0 port. Alienware 17 R3 (Late 2015) has excellent viewing angles. The image below illustrates how the screen looks when viewed at a 45° angle. The mean maximum brightness (measured at 9 sectors of the screen), before profiling is very high – 352 cd/m2. The maximum deviation is just 4%. The average color temperature of a white screen at max brightness is 6970K – daylight type, slightly colder than the optimum of 6500K. The black dashed line triangle represents a new standard – Rec.2020 for UHDTV. The space is defined by three main monochrome colors with wave lengths of 630 nm, 532 nm and 467 nm. The yellow triangle represents the possibilities of Alienware 17 R3 (Late 2015). Having in mind that most laptops on the market can’t even cover half of the sRGB space, you can make conclusions for yourself what the difference will be in terms of saturation and picture quality. The figure below is practically the same but marked with our measurements before calibration. The colored dots are the colors with 100 and 50 percent saturation in the new Rec.2020 (UHDTV) color gamut. The white dots are the ones provided by Alienware 17 R3 (Late 2015). We profiled the screen at 140 cd/m2 brightness level and target color temperature of 6500K. Our tool was X-Rite i1Display Pro. We tested the screen using 24 samples of the most commonly occurring colors and ones that are easily distinguished by your eyes – dark and light skin, blue sky, grass green, orange. The accuracy is incredible – the average DeltaE 2000 = 0.37. Values below 1.00 can’t be differentiated by the naked eye. The contrast is 940:1 before and 930:1 after profiling. The histogram below shows part of the colors in the verification report. Alienware 17 R3’s display doesn’t use PWM for brightness control. This makes it suitable for continuous gaming sessions. The screen of Alienware 17 R3 (Late 2015) goes to a whole new level in the evolution of laptop displays. It has amazing details, full sRGB coverage and excellent viewing angles. The maximum brightness is high and it doesn’t cause eye fatigue even in prolonged use, since it doesn’t make use of Pulse-Width Modulation for controlling brightness. We can’t really say anything negative about the AUO 2DK4K-B173ZAN screen in Alienware 17 R3. Alienware 17 R3 (Late 2015) has very good stereo sound quality. The low and medium frequencies are clear, but the highs have somewhat metallic-sounding distortions. The speakers are very loud. 92Wh should be enough for decent battery life of Alienware 17 R3, even though it has a powerful 6820K processor (rather energy-efficient, though), GeForce GTX 980M (the fastest single mobile GPU) and 4K IPS screen. To make sure, we’re going to check on that by using our standard battery tests including Surfing the Web, Video Playback and Gaming. We conduct all tests with Wi-Fi connected, 120 cd/m2 brightness and Power Saver mode. 312 minutes in one charge (5 hours and 12 minutes) is a pretty impressive result, almost identical to the one reached by Acer Predator 17 (315 minutes). Alienware 17’s video playback endurance result is even higher than the Predator’s – 356 minutes (5 hours and 56 minutes). For accurate simulation, we used the Metro: Last Light benchmark running on a loop with graphic settings set to minimum. You wouldn’t go playing outside with your Alienware 17 without a charger, right? We wouldn’t recommend it, in any case. You’ll run out of battery juice in just 79 minutes. Fritz is a chess benchmark that tests the computing capabilities of the CPU with various chess moves. 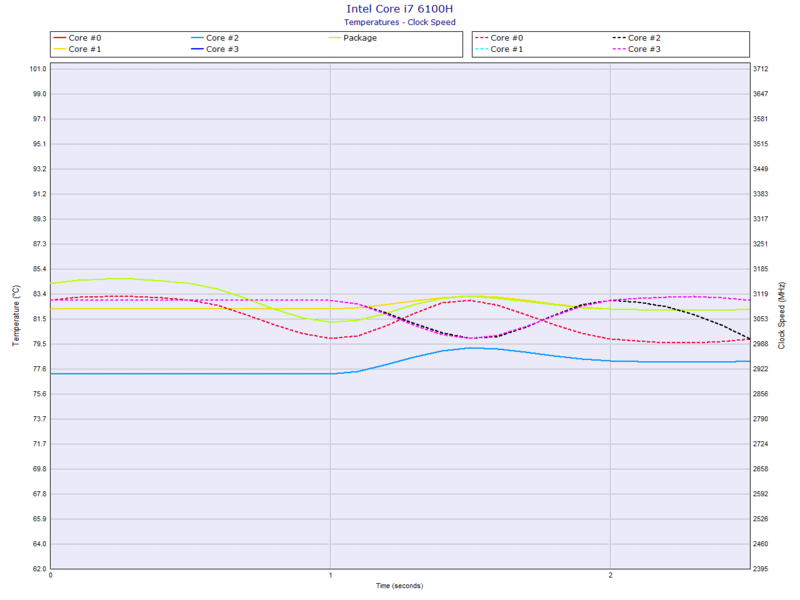 The Intel Core i7-6820HK managed to get 12.861 million moves per second. In comparison, one of the most powerful chess computers, Deep(er) Blue, was able to squeeze out 200 million moves per second. In 1997 Deep(er) Blue even beat the famous Garry Kasparov with 3.5 to 2.5. Here you can see an approximate comparison between the GPUs that can be found in the Alienware 17 R3 models on the market. This way you can decide for yourself which Alienware 17 R3 model is the best bang for your buck. We conducted the gaming tests in three resolutions – 1366 x 768 (HD), 1920 x 1080 (Full HD) and 3840 x 2160 (4K, UltraHD). We used the 359.00 driver version. For the ultimate gaming experience temperature stability is more than important, and a high-end model like the Alienware 17 should undoubtedly provide that. That’s why we’re going to run some heavy torture tests, trying to spot weaknesses (if there are any). We start with 100% CPU load which, apparently, doesn’t bother our Alienware 17 R3 the slightest – its Core i7-6820HK runs at around 70°C. Half an hour later things are pretty much the same – 71-74°C temperature and a remarkable frequency of 3.2GHz, which is the maximum Turbo Boost for this processor. 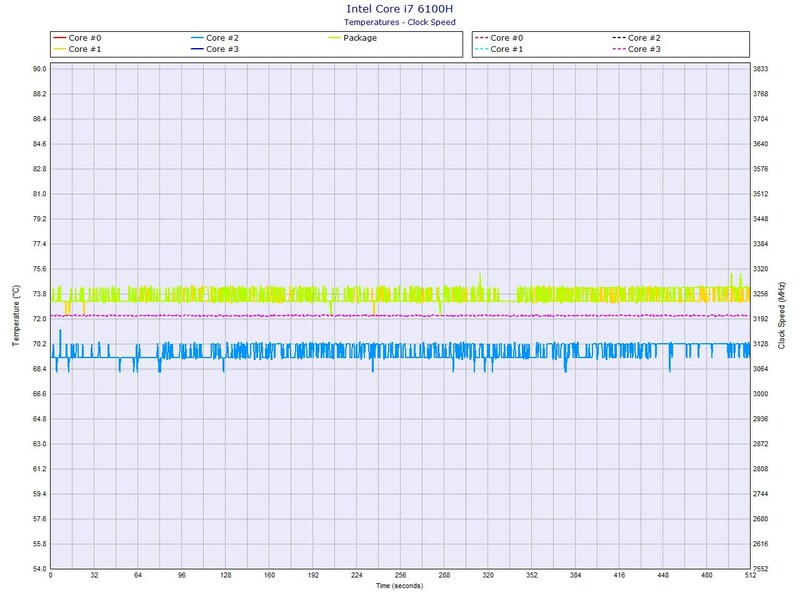 Take a look at the graph below – it indicates the CPU’s temperature and its frequencies around the half hour mark. Without cutting off the CPU load, we’re adding 100% GPU load to Alienware 17 R3’s NVIDIA GeForce GTX 980M. It almost immediately reached 73°C, which is a good result. It’s also good that the notebook stays quiet even when tested to its limits. 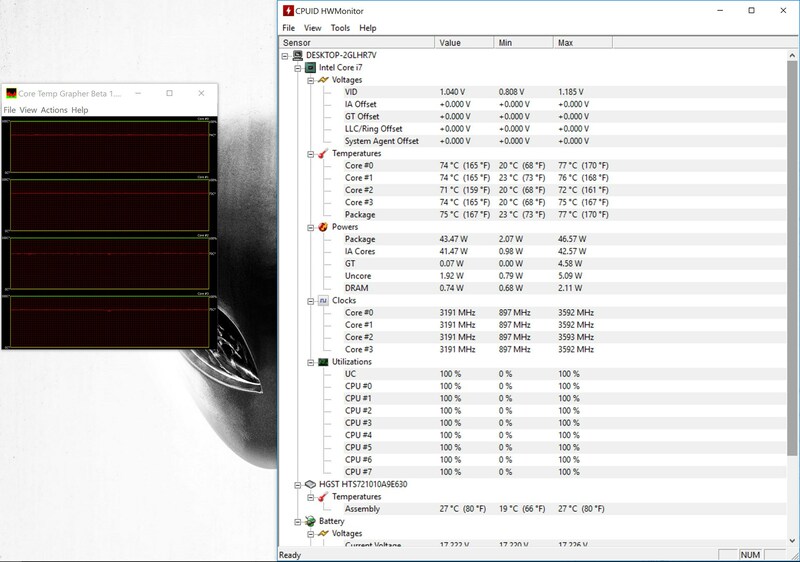 After 2 hours of maximum CPU and GPU load, we’re measure the outside surface temperatures of the notebook. It’s nice to see that, even in conditions which don’t represent real life usage (it’s nearly impossible to achieve this kind of load without synthetic software), Alienware 17 R3 keeps relatively low on the temp scale, not just internally, but on the outside as well. The hottest point is near the air vents (55°C) but this isn’t an area that you’ll be concerned with while working. 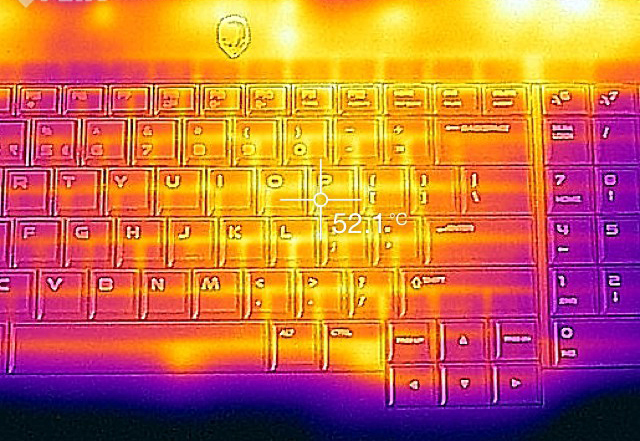 The hottest point on the keyboard is ~50-52°C around the P and O keys. 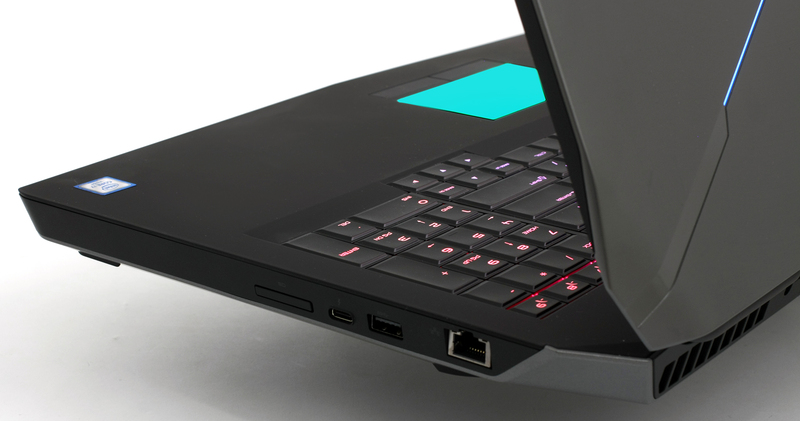 In other words, Alienware 17 won’t cause you any discomfort even during long gaming sessions. Let’s talk about the notebook itself – it has great CPU and GPU performance (Intel Core i7-6820HK, GeForce GTX 980M) and blazing fast storage (NVMe SSD). It feels and looks alien… in a good way. It has aggressive design with sharp lines and glowing elements, and its construction is so rigid, we doubt you’d stumble upon any problems in the years following the purchase. Alienware 17 R3 has a 4K Ultra HD IPS IGZO display, which is the best notebook display we’ve tested ever – it covers 100% of the sRGB and AdobeRGB color gamuts, has high brightness and good contrast, and most importantly – it doesn’t use Pulse-Width Modulation across all brightness levels. Despite its more than 8 million pixels, R3’s battery provides over 5 hours of Web Surfing in one charge. Last but not least, Alienware 17 R3 has great thermal management and even when its CPU and GPU are loaded to the maximum, you won’t experience any discomfort or tangible throttling. Would you recommend this Alienware or an ASUS G752VY-RH71 (same CPU, same GPU, FHD screen with G-Sync)? Hope this helps you to decide which one is best for you. I use photoshop a lot and do games also. and I just want sRGB 100% settings(not more). but this one even supports adobeRGB and I have never done calibration. so do I need to calibrate to make this monitor just srgb? or are the bassic settings very close to srgb when I buy it? I color calibrated with spyder5. i put icc profile in video description via google drive. Used an Adobe 1998 RGB Color Gamut and recommended 6500K color temp target. You never mentioned the maximum brightness of that gorgeous display. Hello, Matthew! Thank you for the feedback. Your opinion is valuable and we hope that other readers will take it into account, in case they have the same needs as yours! We value your participation in our discussions, keep it up 🙂 Cheers! Just bought one for me and my wife the other day. Should arrive pretty soon. We did have the i7-6700HQ processor though, and did not have the possibility to upgrade it. There should not be any super significant differences, correct? Amazing computer! I did a lot of research into buying a laptop with desktop power as I don’t have space for a desk top set up and I’m on the move most days. I looked into origin and MSI and honestly this alienware offered the best specs I could ask for and amazingly cheaper than the other brands! so I just ordered my Alienware 17 R3 with 4K screen and Intel I7 6820 4.1 ghz! I can’t wait! this alienware 4k or g752vy? Can you review the Razer Blade Stealth UHD display? So how’s the Alienware fannoise nowadays? My former Alienware 17 was, under heavy load, as loud as a vacuum cleaner. I traded the r17 for an Asus which is quite silent, even after heavy gaming/rendering.Wondering if the R17 (2016 model) is more quiet as i would really have a 4k screen for my new laptop. (so it’s an Alienware R17 or Asus G752 for me). SLI? What are you talking about? 17 R3 has an integrate gpu…intel 530 and an nvidia 980m or 970m. you can pair the amplifier which disables the 970m/980m. 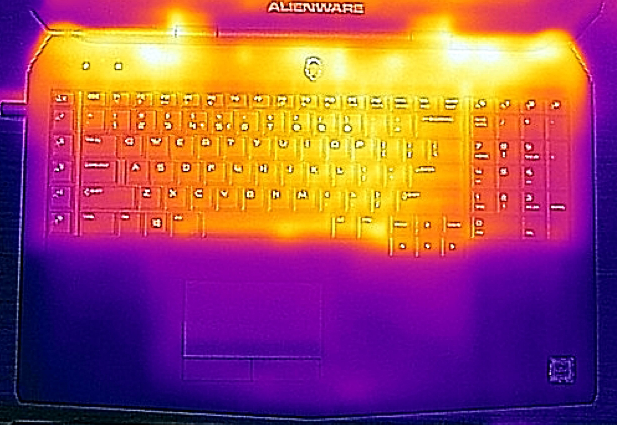 I have this laptop and there is no thermal issue at all. Just got a new Alienware R3 and it’s unusable at 4K. Nothing scales right & I have had to cut back to half that. At 4K, cursors are almost invisiable – In World opf Warcraft cursor is about 3-4mm and in RIft the same. Also the same problem in Second Life. So I have scaled back to 1920×1080 and then I am trying to increase the text to get it to all work. I have a Qosimio 5yo machine does a better job.